This is my latest attempt at building a working helicopter. Previous iterations used a fully mechanical cyclic to overcome limitations in code speed. The result of this was a large assembly under each rotor and the helicopter was barely controllable when it ever managed to generate lift for long enough to get off of the ground. This version is much more light weight and uses a software cyclic which works much better. 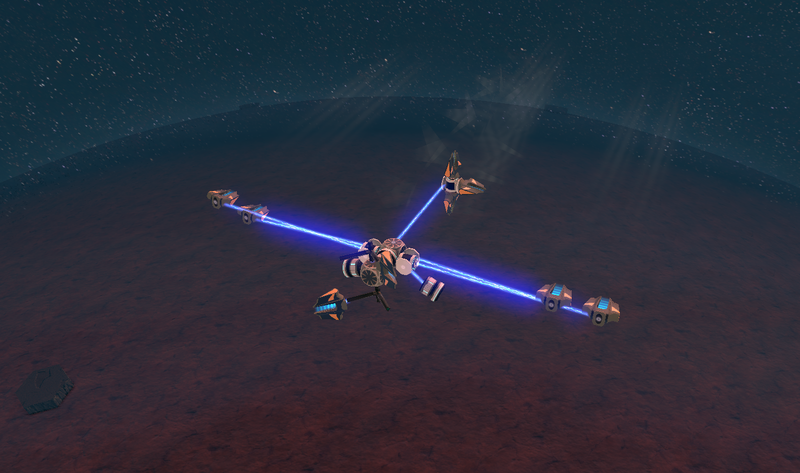 The system to synchronise the interleaved twin rotors is also massively improved and completely prevents collisions even with asymmetrical loading on the two rotors. The result is a stable platform that replicates all the key functionality of a real helicopter. It turns out that the tail isn't really necessary, and actually negatively impacts the performance when not flying forward. The bare V shaped rotor assembly would probably happily fly on its own. C/T- Throttle: This sets the speed of rotation of the rotors, and should be set to full while the helicopter is in operation. The currently set operating speed is by no means optimal, but provides a satisfactory compromise between generating enough lift and not outpacing the cyclic control code. G/H- Collective: Alters the pitch of all of the rotor blades to increase/decrease the amount of lift generated. F/P- Cyclic roll: The cyclic control individually varies the pitch of each of the rotor blades over the course of each revolution. This causes one half of the rotor to generate more lift than the other, creating torque that alters the attitude of the helicopter. D/U- Yaw: Acts as a rudder to change the heading of the helicopter by increasing the pitch of one rotor while decreasing the pitch of the other, creating an unbalance in the torque between the two rotors. And here's what makes it tick. The two big blocks are the phase shifts and sine functions to calculate the correct angle for each blade. 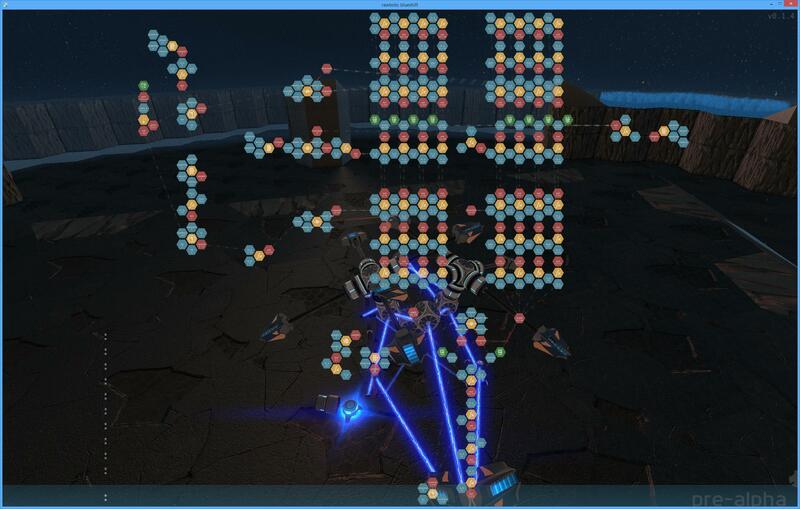 On the left are a couple of basic controllers to keep the helicopter roughly level, and the code going to the bottom of the screen is to sync the two rotors. Close, but no cigar. Really, I'm just impressed that it managed to lift something so huge that far without falling out of the sky. ladies and gentlemen the marvelous marvin never fails to impress! unlike me.. god the goblinABRT was bad.. I'm not entirely sure there isn't actually some witchcraft going on, as the software cyclic outright refused to work at all last time I tried it, hence the use of a mechanical version. 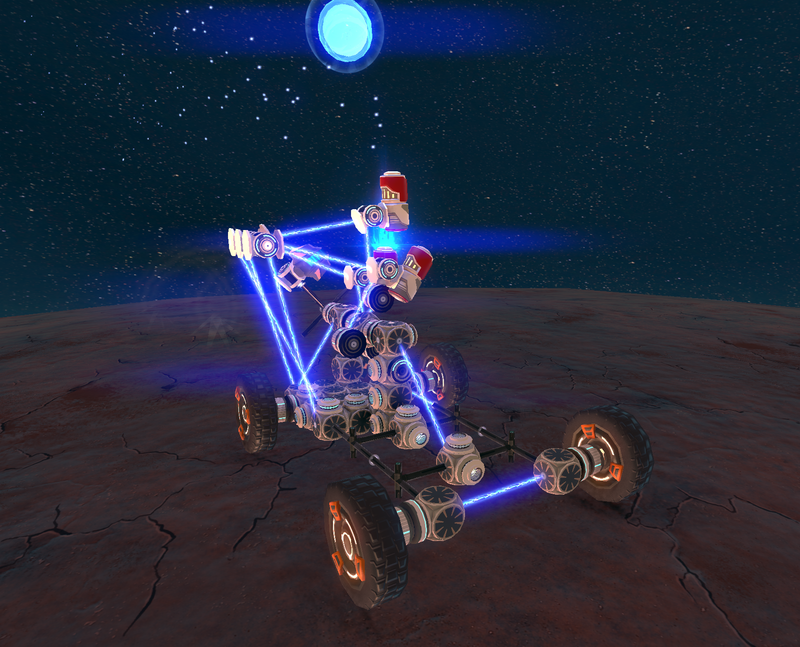 Doubling the rotor speed and increasing the limit on the blade pitch a little increased the lifting capacity significantly, allowing it lift well over 3/4 of that bot while staying controllable. I did use two fins per blade on my big helicopter, but the weight of that plus the component in the cyclic linkage were probably a major contributor to the poor performance. BTW, that particular spherical wheel bot is mine, though I wouldn't be surprised if pressureline has done a better working one. 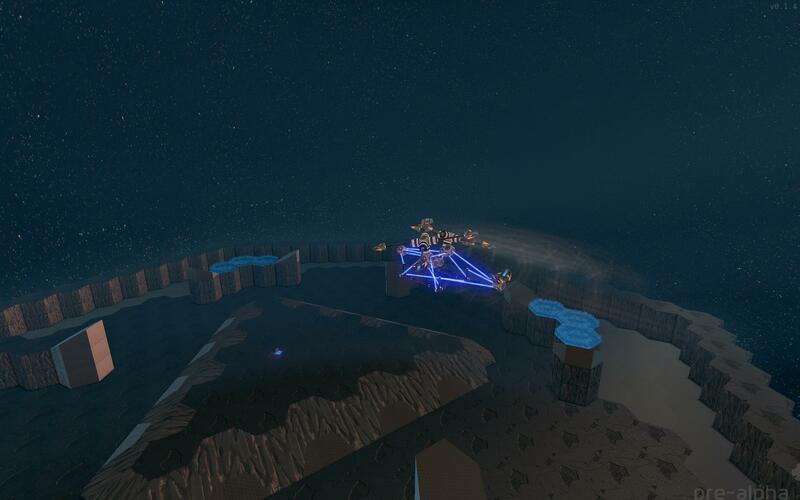 Blueprints for that and the old mechanical twin rotor are available if anyone wants them. I just saw pressureline post an image of it one time so i assumed. Also, your bot has weird input keys. If it works for you thats all that matters. The weird keys are a result of using a Dvorak keyboard and rawbots not liking punctuation keys. Tried turning the helicopter into an autogyro yesterday, but the rotors barely turned. 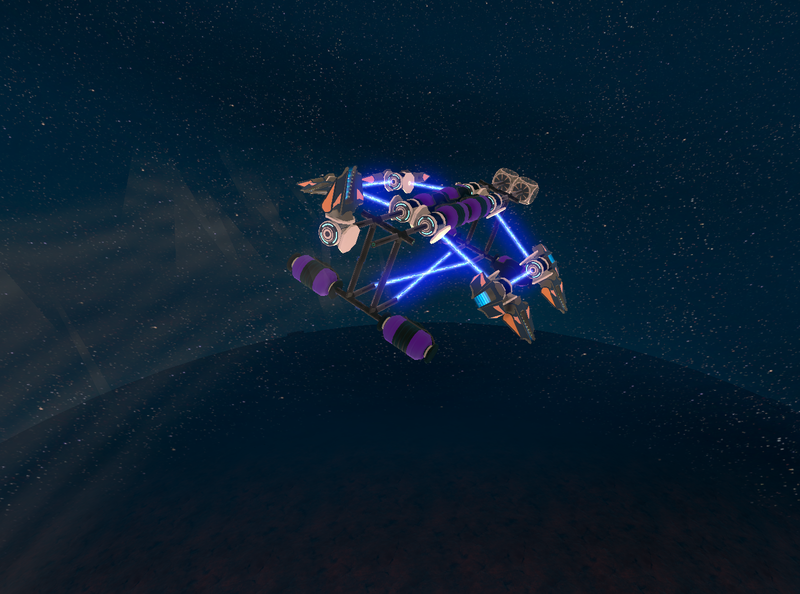 For some reason propeller planes are surprisingly difficult to make work in rawbots. It is especially odd when you consider the availability of infinite power, perfect aerofoil surfaces and disproportionately low gravity. Also, the worst possible propeller designs seem to work best, hence the high thrust version fitted to the blueprint. A standard twin blade prop works too, and permits takeoffs from the ground under its own power. F/P- Roll. Some trim is automatically applied. D/U- Yaw. Release set to zero to trim out most of the remaining weird torques. Single prop racing/time trials could make for an interesting challenege seeing as speed is fundamentally limited unlike trying to do anything like that with jet aircraft. This is a much more refined version of the original propeller plane. The structure is much stronger and more aerodynamically stable. The main landing gear is now retractable, and a steerable tail wheel has been added. Pitch control has been moved to the tailplane, and the main lifting surfaces can act as flaps, permitting low speed takeoffs. The two blade fixed pitch propeller currently fitted is fully capable of vertical and interplanetary flight and produces relatively little torque when up to speed. 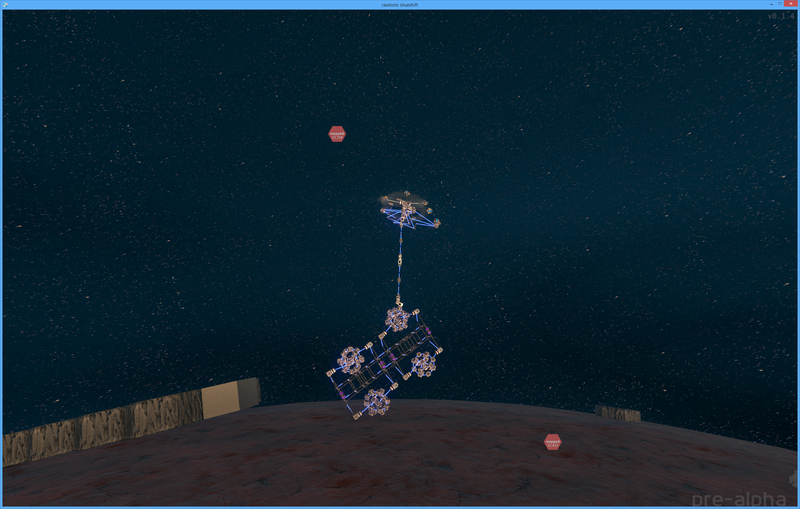 I also started to add a cannon, which is somewhat synchronised to the propeller, but needs some work. O/E- Yaw trim. Mostly redundant since adding automatic yaw control. This has taken many, many attempts to get to a state that could be called working, which really is a testament to how well Trooks flapping glider worked back in the days of old rawbots. This flapping bot is capable of vertical takeoff and generating forward thrust. Each wing is split into a front and rear section, whose phase and amplitude can be controlled ta move the balance of lift forwards and backwards and provide forward thrust. When the wings are not flapping, the twisting lets them work as control surfaces to some extent, although the pitch ends up being inverted. It's actually quite realistic how the flapping can be cut in mid air and it will continue to glide before turning the flapping back on. The bot isn't especially polished, and the roll control is kinda tricky, but I thought people would like to see it. H- Toggle deploy tail fin. Probably not a good idea. C/T- Adjust forward thrust. Release set to 0. Can usually be left set to full forward, and setting to reverse probably kills a lot of the lift. There isn't really much point to this other that it looks cool. It's a 3 cylinder plasma cannon engine fitted with a propeller. Produces a kinda useful amount of power from 12 caps. The dream is to put an engine like this into a plane that can fly under its own power, which may be feasible with a double acting (two cannons per 'cylinder') design and more caps per cannon. For now it's just fun to crank it over by hand and watch it spin up to speed. C/T- Trottle. Release set to 0. Controls capacitance, but the caps don't get a chance to fully charge so this doesn't have much effect. 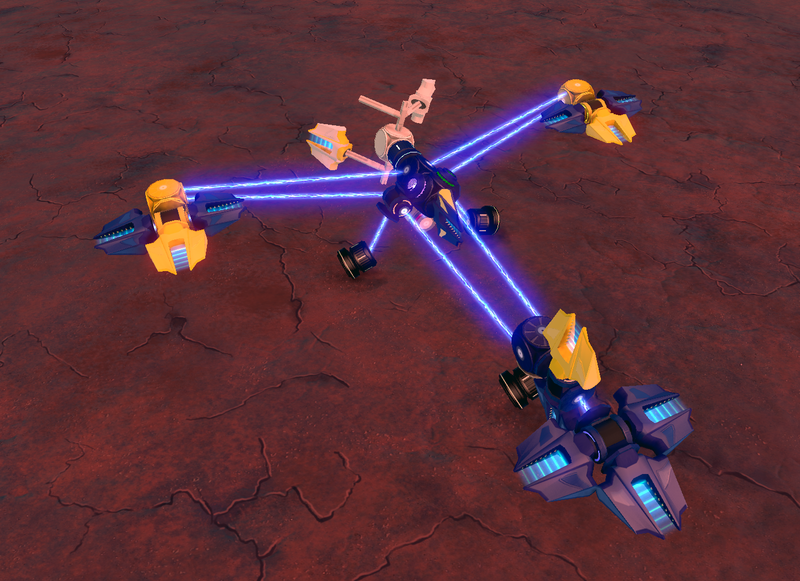 Propellers in Rawbots are weird. The high torque they require and their dependence on airspeed make them ideal for quadrotors, but very tricky for planes. I was looking for a better design to power my planes, so I've characterised several different configurations to try to find out what works best. I've put the results in a couple of spreadsheets. The first set of tests were for static thrust against torque, measured by balancing the thrust against a jet. The offset elbow type is the one seen fitted to my propeller plane above, and turns out to be the best fixed-pitch design over much of the range tested. Logically, a faster spinning, lower pitch prop should require less torque to provide the same thrust, however this only appears to be accurate at the lowest power levels. In general, a 45 degree pitch works pretty well. For best performance, use the largest diameter prop you can, and offset the fins slightly, like the offset elbow design. Optimising the pitch over a range of airspeeds is where things get really weird. With a fixed 45 degree pitch and constant torque, the rotational speed only changes by 12% from stationary to a forward speed of 70 while the trust decreases linearly. This suggests that most of the torque requirement goes into just spinning the prop. When the pitch is optimised at each speed, the thrust shows more of a 1/x decay with airspeed, enabling much higher aircraft speeds to be attained (to the point where the wheeled test platform used for these tests reached escape velocity). Interestingly, the rotational speed of the prop stays largely constant throughout the test. For most sensible speeds, the pitch can be mapped linearly to forward speed. Overall, it's probably better to just use a lightweight fixed-pitch prop optimised for lower speeds, but higher pitches will be needed to go fast. Nice analysis, a screenshot or two of your testing rig could be a nice addition. Your graphs don't show anything on my end however. I'm not quite sure on what the single letters mean, I assume v is velocity of plane, w is veloctiy of prop and t is thrust? what is f? If I understand correctly, changing fin angle might be a better way to regulate speed than changing the rpm? Also, what about prop diameter? is increasing that equivalent to increasing the prop speed while decreasing rigidity of the rotor?